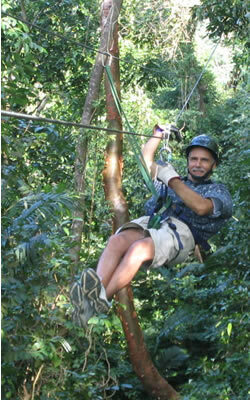 Take a Canopy Ride and glide down a 200-meter cable thru a tropical forest and enjoy the 50-acre Garambula Park at West Bay. Enjoy beach activities, a Pirate display with treasures and history of Roatan. Later interact with free roaming monkeys and talking birds. A must trip for the whole family. Dolphin encounters at one of the world’s best marine science museum. Free shows! Swim & snorkel with instructors in a cay with dolphins. 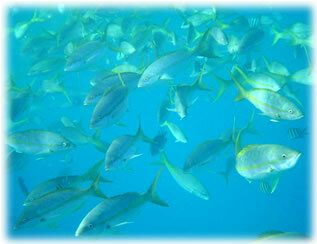 Sport-fishing in the shallows or deep water! 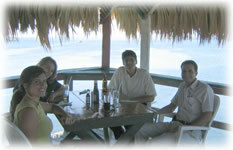 Roatan has charter services located at West Bay Beach, West End Village or Sandy Bay. Prices vary from $10.00 - $50.00 per day with guide. 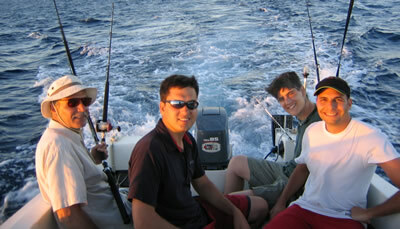 Let us make an appointment for a guide to take you Bone-fishing on the flats surrounding Roatan. Roatan’s temperatures average 80 degrees Fahrenheit, with turquoise colored waters equally warm. The island is rimmed by the world’s 2nd largest reef, creating an underwater environment for spectacular scuba diving and other water sports. The best reefs on Roatan are a few fin kicks from shore. Put on your mask, fins and snorkel and drop into an underwater ecosystem. The Cayman Trench, which created the 2nd largest barrier reef in the world, makes Roatan a divers paradise. Treat your eyes to an underwater terrain exploration of spectacular reefs grooved by angled chutes, tunnels, ledges and volcanic mazes forming the greatest diversity of coral, sponge and invertebrate species in the Caribbean Seas. View the amazing species along the famous 100-foot coral wall. Investigate several shipwrecks like the Prince Albert and the Aguila using one of the 15 dive shops in Roatan. Experienced Dive Masters teach diving at Roatan’ s 5 STAR PADI dive shops. Experience some of the 120 diving sights! The seafood is out of this world with extremely low prices for freshly caught lobster and crab to delight your taste buds. Sea Vue is within walking distance to sea food restaurant’s huddled under canopies of coconut trees on pristine white beaches. 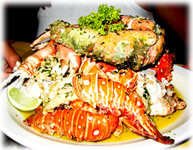 Eat lobster, huge Caribbean king crab, red snapper and more! Whole or filet red snapper & grouper, or quality salmon from chili all fresh! Zip over to west end in a water taxi and enjoy the good food and night life at this Bohemian village on the beach. Feel like eating original Italian food? We have a variety of Italian eateries, Argentina Grill or Bite On the Beach all with their own flavors and colorful atmospheres multi-lingual waiters and waitresses from all parts of the world are ready to make your vacation unique. Let us arrange for an island cook to prepare a typical islanders dinner in the condo while you settle into a sunset reflected in turquoise waters rimmed by white sand. SANDY BAY has Botanical Gardens, a Butterfly Farm, Artists, The Roatan Institute of Marine Science (RIMS) and The Roatan Museum. 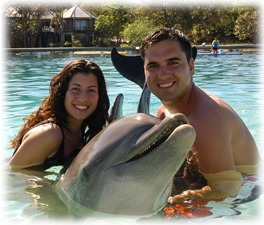 Enjoy encounter shows with dolphins and an educational center with laboratories for coral reef, birds and reptiles. The island hosts one of the worlds best marine science museum with great dolphin shows and dolphin encounters. A good time for families. An Iguana Farm at French Cay close to French Harbor is home to over 3,000 iguanas, 200 lobsters, turtles and a variety of fish. Visitors learn the habits and behaviors of a variety of island animals and the efforts to preserve them. Take a Mangrove Tour from Rotan’s East end. Travel these man-made waterways that connect five harbors. Explore the mangroves and canals by water paths. Hire a water taxi from Jonesville, Oak Ridge or Calabash Bight. Enjoy Wind Surfing school, Parasailing and Jet Skiing. Ask for a map to locate Big Bight where a quarter of a mile lays between the coastline and the reef. Keep alert to certain areas that are limited to water sports in order to protect Roatan's reefs. Immerse yourself in a Garifuna Experience at the YUBU! Ethnic Garifuna Dancing, cultural and traditional activities and a display of the Garifuna history along with Garifuna gifts. Punta Gorda a Garifuna village celebrates in April the arrival of their ancestors to the island. Colorful dancing, a statue and great food can be found at this lovely spot in Roatan. WEST END is a Bohemian village full of everything for the eye. Water taxis can take you from West Bay to lively Nightlife and Music and good food at a variety of restaurants. WEST END also offers great Shopping! French Harbor is the center for the fishing trade. Watch the boat activity from the patios of three famous Restaurants. Show them our SEA VUE business card and get 10% off or a free drink.